Arata is a young boy from Hiougi City. At the start of the series, he's a young kid who scares easily; his knees constantly shake and he always ducks for cover whenever danger is nearby. He soon meets a Keldeo with a similar personality and forms a bond with it. While Arata is a bit cowardly, he is able to put aside his fears whenever his friends are in danger. When the Plasma-Dan go after Keldeo, for example, Arata stands up to take the two grunts on even though he's terrified of doing so. He can be creative in battle despite his inexperience. Two years later, he leaves Hiougi City to start his pokemon journey. His first stop - get a starter pokemon! Arata's ultimate goal is to capture a legendary pokemon. When he hears that the Plasma-Dan have possession of a pokemon known as Black Kyurem, he decides to find it and confront it himself. He is eventually able to defeat the legendary pokemon and cause it to separate back into two but isn't able to catch it for himself. At the end of the series, Arata decides to set out on a brand new journey. 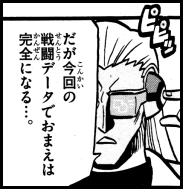 Arata first appears in Chapter One. Cheren is Hiro's childhood friend. He bumps into Arata in the forest just outside Hiougi City and tells him that he hasn't heard from Hiro since he took down the Plasma-Dan. When he finally reunites with Hiro, he's upset at how laid back he is about the whole "being out of contact" thing. Cheren shows that he is a competent battler who is able to hold his own even when the type advantages aren't in his favor. 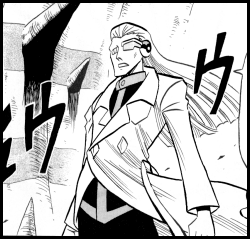 He does lose the battle, but he does so because he and his pokemon rushed to shield Arata, not because of any flaws in his battle strategy. 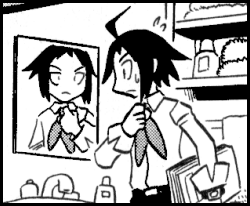 Two years later, we see Cheren getting ready to become a Gym Leader. 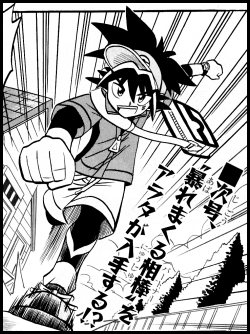 Cheren first appears in Chapter One. 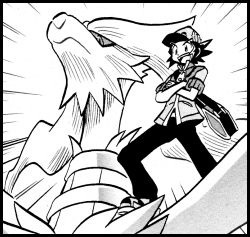 Hiro is the trainer who defeated the Plasma-Dan with his Reshiram. After the group was disbanded, he disappeared. Cheren tried to contact him after this but was unsuccessful. Hiro shows up later to help Cheren fight off the Plasma-Dan grunts who were after the Keldeo that Arata had befriended. Later, he approaches Arata and encourages him to become a good trainer one day. Hiro is laid back and doesn't seem to take things as seriously as his friend Cheren does. Hiro first appears in Chapter One. 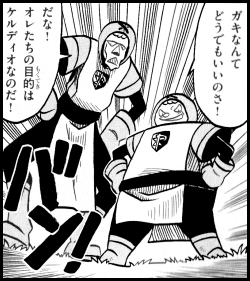 These two unnamed Plasma-Dan grunts first encounter Arata in the forest just outside Hiougi City. The two are after the legendary pokemon Keldeo but are defeated when Arata stands up to them. 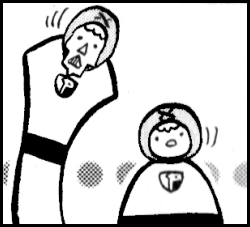 The two grunts were unaware that their organization had been disbanded before Cheren tells them. The two of them tend to switch from being menacing threats to being comic relief goofballs (and back again!) throughout their debut chapter. They return to Hiougi City two years later and attempt to steal the starter pokemon Bel is trying to give out to Arata. They are defeated by Homika almost as soon as they arrive. They appear for a third time in Fossil Valley, this time attempting to capture the mysterious pokemon that had been rumored to reside there. 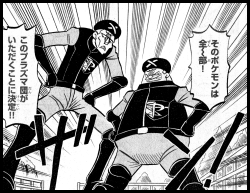 When that pokemon reveals itself to be Genosect, the shorter grunt attempts to subdue it with his Habunake. 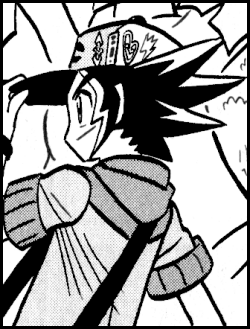 His pokemon is quickly defeated and is at Genosect's mercy until Arata steps forward and saves it. The Plasma-Dan members are moved to tears at the sight of their enemy risking his life to help them. Their final appearance is at Giant Hole, the canyon where Zekrom and Kyurem fuse together to become Black Kyurem. 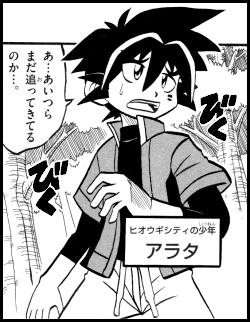 They explain to Arata that the pokemon is out of their control before running away. Their current whereabouts are unknown. The Plasma-Dan grunts first appear in Chapter One. 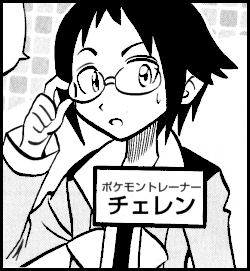 Bel is Araragi-Hakase's assistant responsible for giving trainers their starter pokemon. She is eventually able to identify Homika as a Pokemon Trainer / singer from Tachiwaki City, though she doesn't seem to remember that she's also a Gym Leader. Bel is a carefree girl who doesn't complain when Arata makes her wait half a day for him to choose his starter pokemon. 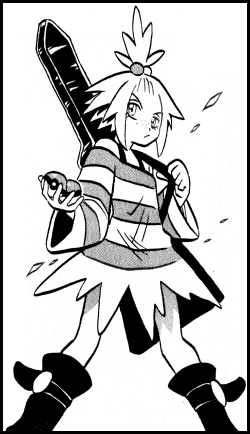 She can be seen in a panel summarizing the two years between the events of Pocket Monsters Black / White and Pocket Monsters Black 2 / White 2 in Chapter One, but she doesn't have a real speaking role until Chapter Two. Homika is the Gym Leader of the Tachiwaki City Pokemon Gym. She specializes in Poison-Type pokemon. Homika first appears to help Arata and Bel fight off members of the Plasma-Dan who had come to take their pokemon. After she retrieves the two pokemon they had stolen, she decides to keep their Monster Balls instead of returning them to Arata because she doesn't believe he's qualified to raise them. When he insists that he does, she offers to let him prove himself in a pokemon battle. If Arata loses, she says, he'll have to quit his journey and return to his home! After hearing this, Arata remarks that she's "scarier than the Plasma-Dan." Homika is a singer in addition to being a Pokemon Trainer. She boasts that she gives both her hobbies everything she's got and appears to look down on those who don't do the same. She worries that Arata doesn't have the heart needed to be a Pokemon Trainer and is impressed when he eventually learns to become one with his Mijumaru. When Arata defeats her, she promises to give it her all whenever they battle again. She returns the two Monsters Balls to Bel and leaves. Dr. Zeno (pronounced Zeh-noh) is an ex-Plasma-Dan scientist who was cast out of the organization for conducting the unnatural experiments that led to Genosect's revival. Now, Dr. Zeno wants to prove to the organizaton that they were wrong about his work by turning his creation into an unbeatable battle machine. In addition to reviving Genosect, he is also able to use the data he's collected from its battles to create cassettes that can then be used to change the type of Genosect's "Techno Buster" technique. Dr. Zeno doesn't care who gets hurt during his quest to make Genosect the perfect fighting machine. In fact, he doesn't even mind if he becomes a casualty himself! He believes that Genosect will carry on his legacy no matter what and that his continued existence is not necessarily required for this to occur. He believes that his creation's lack of a heart makes it stronger, but when Genosect risks its life to save him he realizes that he was mistaken. 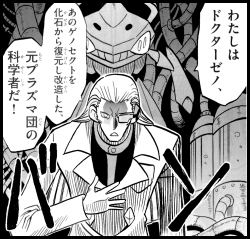 He sees the error of his ways and tells Arata that he should take Genosect along with him to bring out its full potential. Dr. Zeno wears a device over his left eye that appers to feed him information regarding Genosect's abilities. Dr. Zeno first appears in Chapter Three.